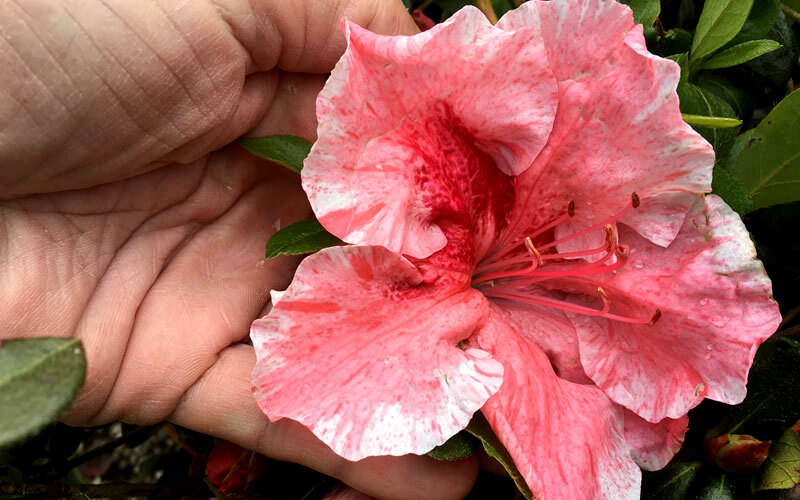 A multi-color flowering beauty with GINORMOUS 5-inch flowers, 'Tama-no-Hada' is a rare Satsuki hybrid evergreen azalea whose immense white flowers are heavily striped, streaked or splashed in coral and/or red shades. Solid color flowers also occur as do red-blotched ones. 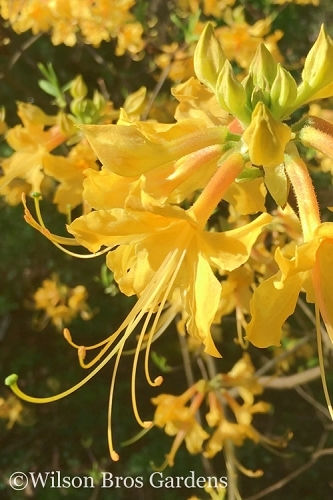 The flowers also vary in size and shape and are borne in abundance later in the season from May to June, extending the azalea blooming season in your garden. Get all the details below! 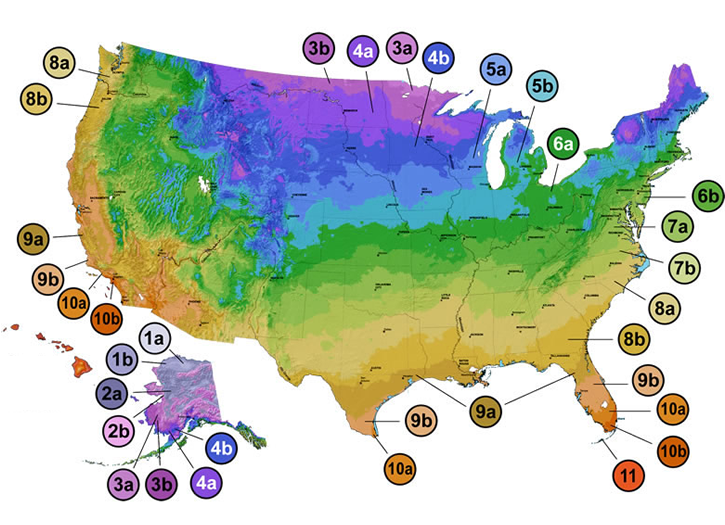 Note: For our customers who live and garden north of USDA Plant Hardiness Zone 5a, where this Azalea variety is not winter hardy outdoors, you can enjoy it in containers that can be moved indoors during winter and placed back outside when temperatures warm up in spring. 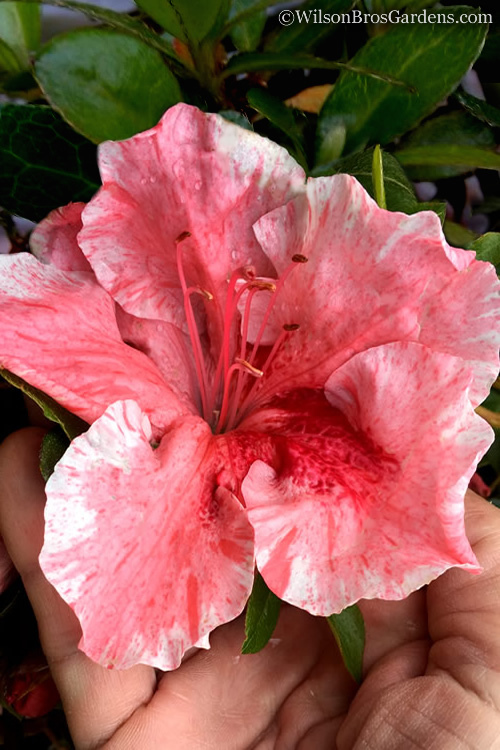 A multi-color flowering beauty with GINORMOUS flowers up to 5 inches across, 'Tama-no-Hada' is a rare Satsuki hybrid evergreen azalea whose immense white flowers are heavily striped, streaked or splashed in coral and/or red shades. Solid color flowers also occur as do red-blotched ones. 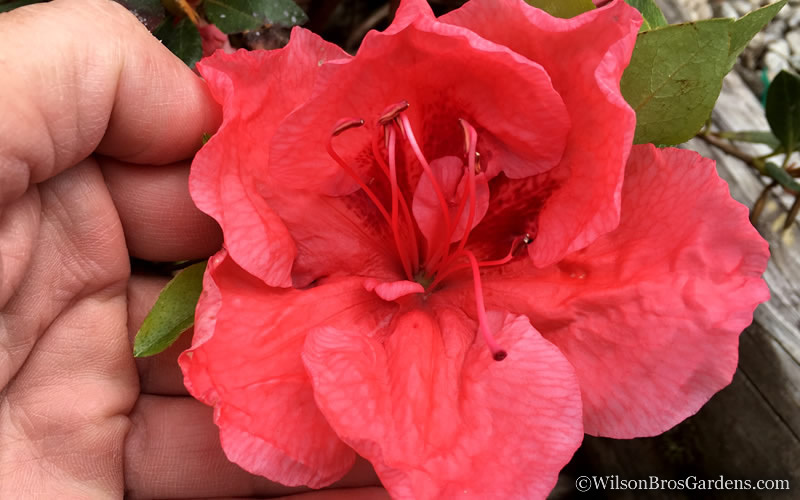 The flowers also vary in size and shape and are borne in abundance later in the season from May to June, extending the azalea blooming season in your garden. The leaves also vary widely in size and shape, usually lance-shaped to elliptic. 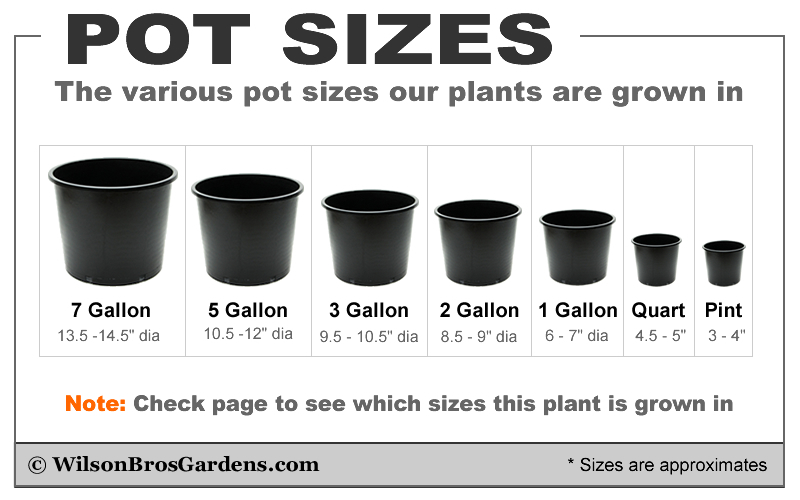 The plant itself grows to about 2 feet tall with spreading branches that will cascade down walls or the sides of pots and planters. A truly amazing Azlaea that is anything but boring and sure to be a conversation piece! The Satsuki Japanese azaleas are believed to have originated several hundred years ago from natural crosses between R. indicum and R. tamarae. 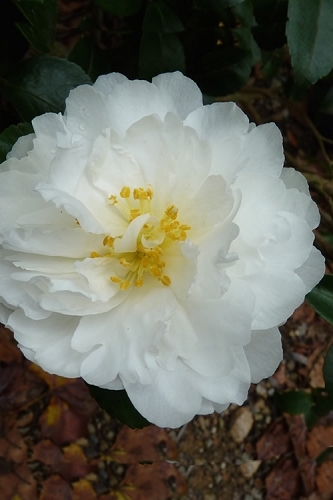 Later, horticulturists continued the crosses between these two species as well as others. 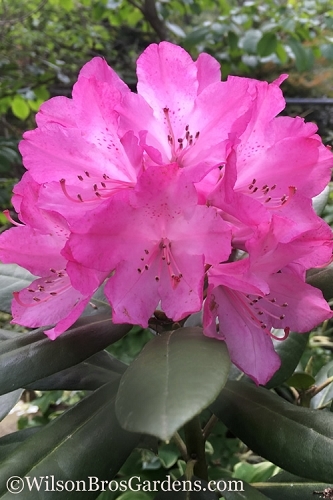 Growing in a low mound 24 to 30 inches tall and 3 to 4 feet wide at maturity, 'Tama-no-Hada' Azalea is ideal for use as a specimen in small garden spaces and containers 12 inches or more in diameter. In larger landscape borders or home foundation plantings plant it in groupings to masses or as a border along paths. 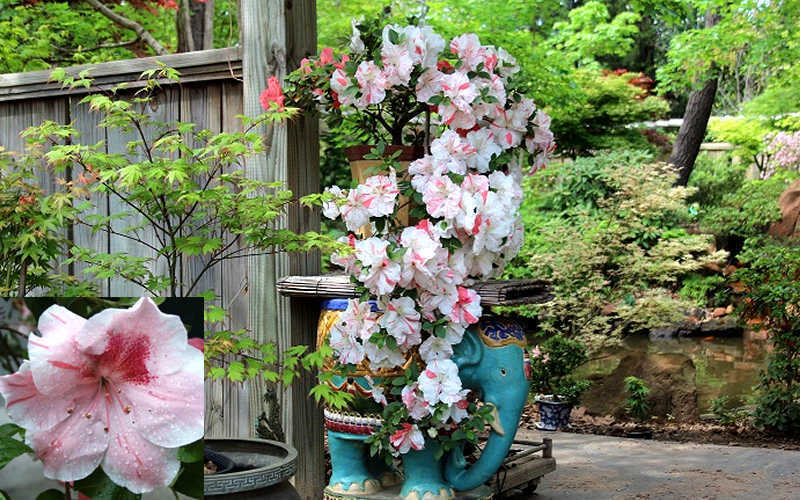 A fine addition to Asian-theme gardens, Azalea gardens, pink theme gardens, cottage gardens, and partially shaded woodland gardens. 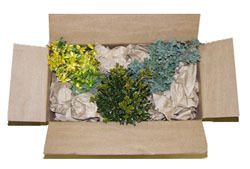 Evergreen Azaleas are easy to grow when planted right and in the right spot. 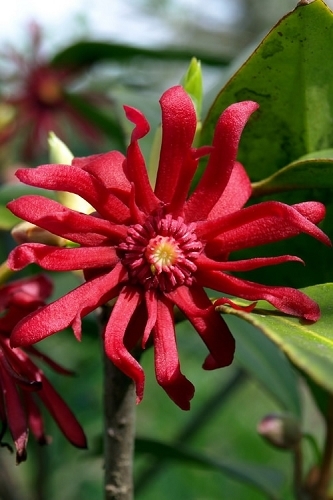 They prefer a moist but well-drained and acidic soil that is rich in organic matter and part sun. Morning sun with afternoon shade or filtered sun is ideal. Moderate drought tolerance when established. 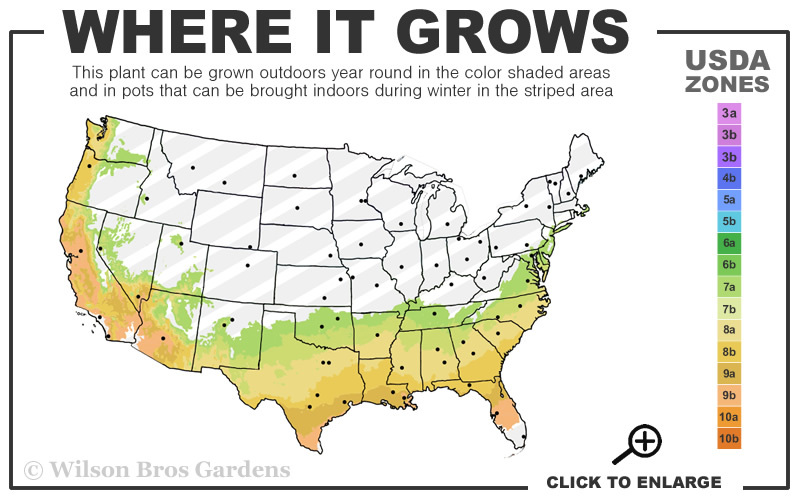 Does not require pruning however responds well to a light annual pruning after bloom. 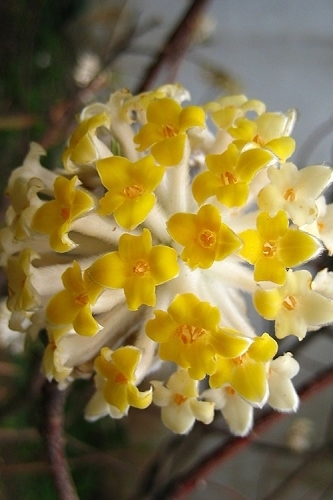 Flower Size: Large, up to 5 inches across!